Scalable data platforms such as Apache Hadoop offer unparalleled cost benefits and analytical opportunities. IBM helps fully leverage the scale and promise of Hadoop, enabling better results for critical projects and key analytics initiatives. 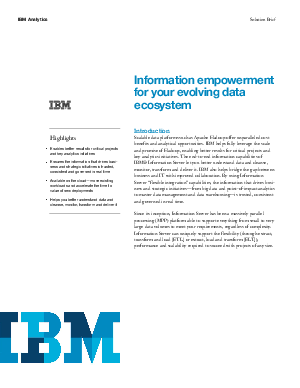 The end-to- end information capabilities of IBM® Information Server let you better understand data and cleanse, monitor, transform and deliver it. IBM also helps bridge the gap between business and IT with improved collaboration. By using Information Server “flexible integration” capabilities, the information that drives business and strategic initiatives—from big data and point-of- impact analytics to master data management and data warehousing—is trusted, consistent and governed in real time. Since its inception, Information Server has been a massively parallel processing (MPP) platform able to support everything from small to very large data volumes to meet your requirements, regardless of complexity. Information Server can uniquely support the flexibility (through extract, transform and load [ETL] or extract, load and transform [ELT]), performance and scalability required to succeed with projects of any size. Information Server for Data Integration: Flexibly transform data in any style and deliver it to any system, supporting faster time to value and reduced IT risk. Information Server for Data Quality: Establish highquality data and manage it, turning a deluge of data into trusted information. Information Governance Catalog: Better understand data and foster collaboration between IT and line-of- business teams to narrow the communication gap and create a framework for information governance. Information Server Enterprise Edition: Gain the capabilities of all three individual packages in one comprehensive offering; start information integration efforts in one area and then expand when needed to further optimize results.